Bubbles is a naughty ninja and needs help to fight the monsters roaming the city. Click here to play! Spin up 5 one-eyed monsters and bank 200 times your bet. Hit 5 crazy lizards and get paid 200 credits or take out the beady-eyed tenticle monster for up to 500 times your wager. Bubbles needs your help and if you spin Bubbles across all 5 reels, she'll pay you 1000 times your initial line bet. Join Bubbles in her fight to save the city and become a Naughty Ninja tonight! A re-spin feature is triggered when a scattered ninja star appears anywhere on reel 3, it covers the whole reel as a substitute and awards a free spin across the 4 other reels. The ninja star substitutes for all other symbols across all positions during the respin, including Bubbles, the regular wild symbol. Bubbles is a bikini-clad naughty ninja with a tight red bandana holding back her black and blue hair. She weilds a sharp ninja sword and will substitute for any other symbol, except the scatter ninja star. 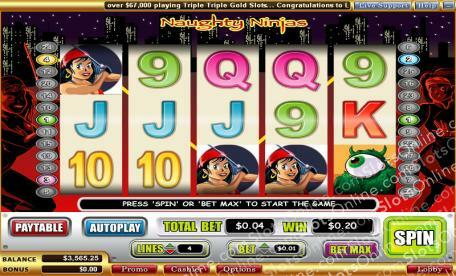 Hit 5 Bubbles across all reels and you will win 2000 times your initial wager! Vegas Technology slots give you the option of 5, 10, 25, 50, 100, 250 or 500 auto play spins. It provides a delay between each spin between 0.25 and 2 seconds, giving you time to see exactly how much money you win each spin. Vegas Tech also gives you the ability to stop your auto spins when a jackpot is won, a single win exceeds a dollar amount, any win, an increase or decrease by a predefined amount or simply, when the number of spins are complete.